Seagate external hard disks are popular and widely used. Despite their high quality, the common issues that happen to other external hard disks could occur with the Seagate ones as well. One of the issues is Seagate external hard disk not being detected, which is often accompanied by data loss and inaccessibility. This article will show you how to recover data from Seagate external hard disk which is not detecting on Mac and Windows, which also applies to external hard disks from other manufacturers. Why is my Seagate external hard drive not detected? The files on it are inaccessible. Is it possible to recover these files? How can I recover them? You will find the answers in this article. In the Fix column, you can click the hyperlinked text to check out the detailed instructions. Before you try to recover data from Seagate external hard disk which is not detecting, it’s important to know the common causes of this issue. To be able to recover files from the undetected drive, you need to fix the issue and make the drive detected and recognized again by your computer. And the fixes can be different, which depends on the causes. If the Seagate external hard disk not being detected problem is caused by software issues, the chances of recovering data from the disk is high with the help of reliable data recovery software. With some hardware issues such as faulty USB port or data cable, after you replace the port or cable, your computer should have no problems detecting the external hard disk. In such cases, there is no need to recover data. However, if the hard drive’s electronics and components are physically damaged from dropping, shocking, sudden power failure, or overuse, etc., you need to get the physical damages fixed before getting lost data back. Here are the procedures you can follow before you try to access or recover data from your disk. If your Seagate external hard drive is physically damaged, go to a hard drive repair shop and fix it. If not, in the table above, find and identify the easily fixable hardware issues. Check these issues one by one. After you complete the checks, if the disk can be detected properly and the data on it is safe, then congratulate to you. If your computer has no problem recognizing the disk but the files on it are lost or corrupted, don’t worry. The rest of this article will show you how to recover them. Just read on. If the problem persists, check out the software issues one by one. It’s easy to update the driver. Virus or malware infection is not common. File system issues and other common software issues can be fixed by formatting your Seagate external hard disk. Recover data lost due to formatting, deleting, hard drive failing, etc. Recover files from Mac, external hard drive, SD card, cameras, etc. 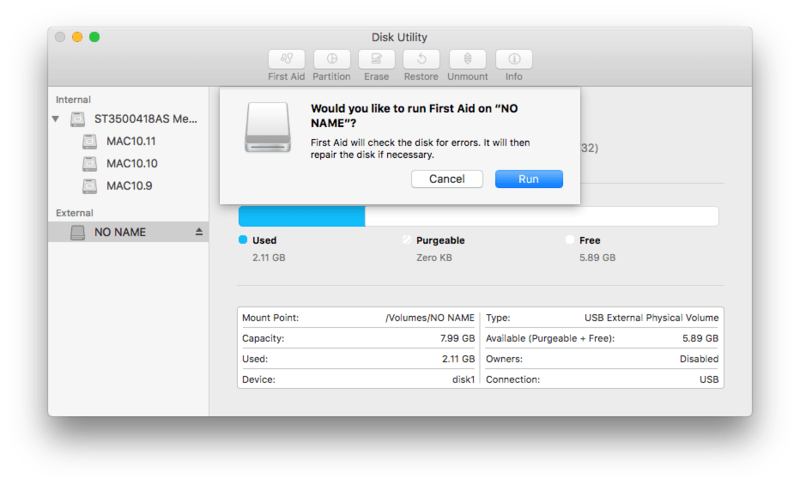 After you complete the above procedures, your Mac should be able to detect the plugged external hard disk. Despite being detected, if you can’t access the data stored on the disk in question, or if you see error messages like “The disk you inserted was not readable by this computer”, there is need to recover the lost or corrupted data. Step 1. Open Finder. From the top menu bar, choose Go > Utilities > Disk Utility. Step 2. From the left-side panel, select the drive in question. Click First Aid. In the dialog box, click Run. Step 3. After the process is finished, properly remove the disk and plug it into your Mac again and see if you can access your data on it. If not, go on with the following steps. Step 4. On the left side of First Aid, you can find the Erase tab. Click the Erase tab. Step 5. A dialog box will appear. Give the drive a name and select a file system. If you only use this external hard disk with Mac, select APFS (Mac computers’ default file system). If you use it with both Mac and Windows, you can select ExFAT which is supported by both operating systems. Click Erase. Note: Erasing the drive will format and delete all data (accessible or not) kept on it. After the process is finished, the next thing is to recover the data. This part is about how to recover the erased data. To retrieve the data from your Seagate external hard disk, you need a reliable Mac data recovery software application. 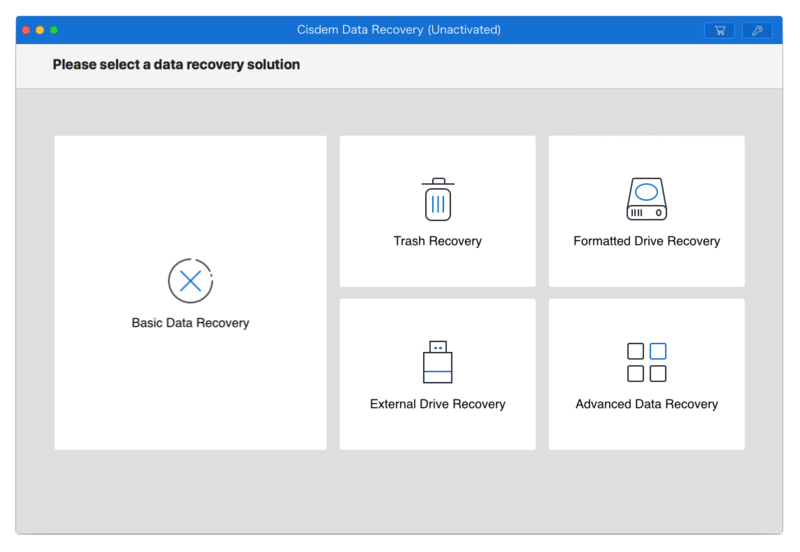 Cisdem Data Recovery for Mac can recover erased, deleted, formatted, corrupted data from external hard drives, internal hard drives, USB flash drive and other storage devices. It supports photos, audios, videos, documents, emails, archives and other files types. 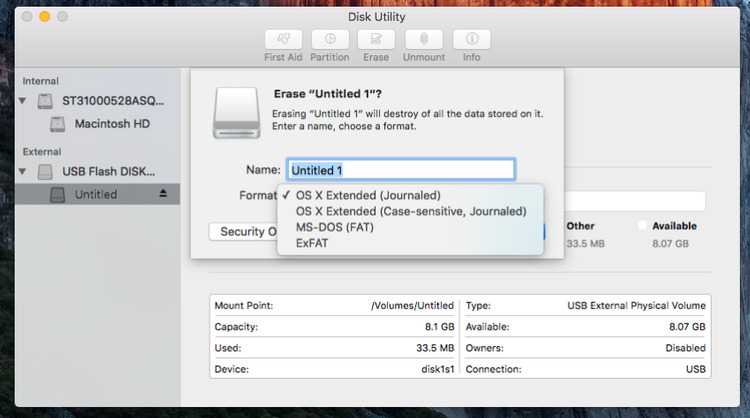 Download and install Cisdem Data Recovery for Mac. Free trial is available from https://www.cisdem.com/downloads/cisdem-datarecovery-10.dmg. It provides five recovery solutions, including Basic Data Recovery, Advanced Data Recovery, Formatted Drive Recovery and more. You can select Advanced Data Recovery. 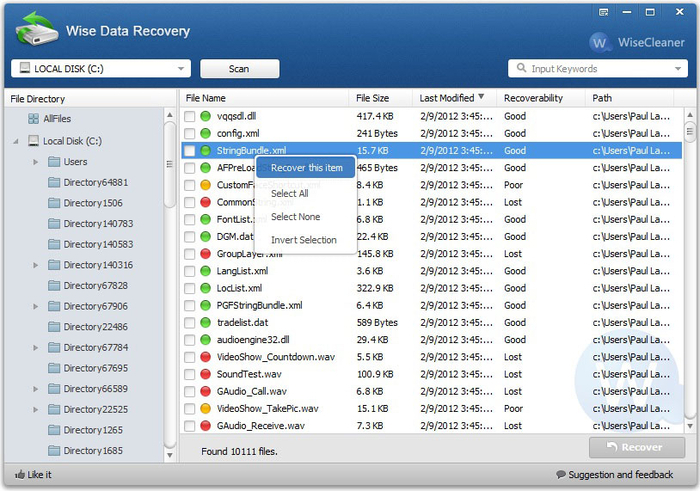 Click the recovery solution, and the “Where did you lose your files?” dialog box will appear. Select your Seagate external hard disk which was previously undetected. Click Scan. During the scan, real-time scan results will be provided. 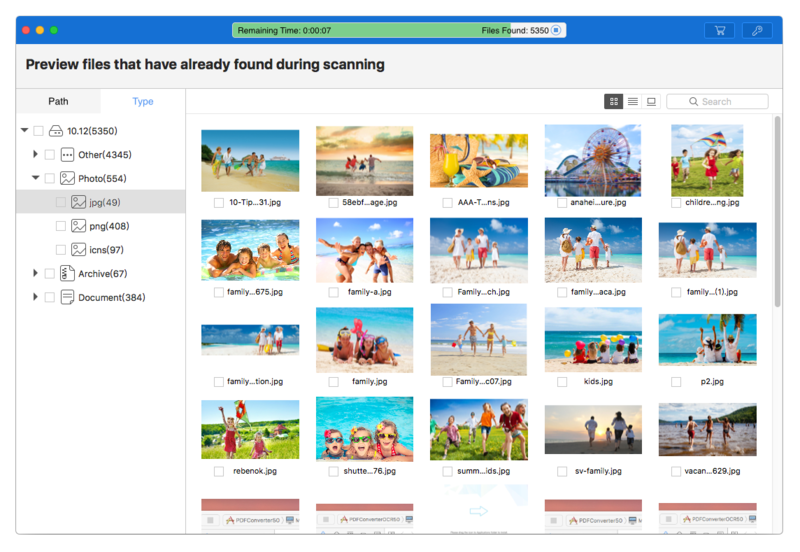 You can preview all the found files which will be displayed in tree view, grouped by file types. From left side panel, select the drive in question and click Recover. You can also select, individually or in batch, the files you want to get back. Cisdem Data Recovery for Mac will start recovering data erased from the previously undetected Seagate external hard disk. Once you have completed the procedures mentioned in the “Causes” part of this article, your PC will be able to detect your Seagate external hard drive. However, while it can be detected, problems like no access to data or disk not being properly recolonized may occur. You will likely see messages like “You need to format the disk in drive G: before you can use it.” If so, you need to format the disk and then recover the formatted data from your external hard disk. Step 1. Install Wise Data Recovery on your computer. This application is able to help you recover data from undetected external hard disk. It is able to recover formatted data, deleted data and other data loss situations. Step 2. Open this application. Select the drive and click Scan. Step 3. After the scan is finished, you will find a list of the recoverable files. You can choose to select an item or select all files. Step 4. Make sure that you have selected the files that you want to recover. Click Recover. If the Seagate external hard disk not being detected problem is caused by the outdated or corrupted disk driver, you need to reinstall or update the driver and make the disk detectable and accessible again. In such cases, there is usually no need to recover data because the data is still safe and accessible. Step 1. Press the Windows key and R key. Type devmgmt.msc. Press Enter. The Windows Device Manager window will open. Step 2. Click Disk drives to expand it. Find your Seagate external hard disk which is not properly recognized. Step 3. Right-click on the disk and go to the Driver tab. Select Update Driver > Search automatically for updated driver software. This usually won’t find a new driver. Alternatively, you can search on Google to see if Seagate provides new drivers for your external hard disk. Step 4. You can also trying reinstall the driver. Click Uninstall Device to completely remove it from your machine. Unplug your disk and plug it into your computer again. Windows should automatically detect it and install the new driver. After connecting the disk to your PC, you can’t find it in Computer. This scenario is not uncommon. In a case like this, you need to let your computer properly detect it so that you can access the data on it. Step 1. Right-click on Computer. Click Manage. This will open the Computer Management window. Step 2. Select Storage > Disk Management. Wait for the options to load up. Step 3. In the window, you should find your Seagate external hard disk showing up as Removable. Step 4. Right-click on it and choose New Simple Volume. The procedures and instructions above can help you recover data from Seagate external hard disk which is not detecting on Mac and PC. They also apply to external hard drives from other manufacturers. If an external hard disk is undetected and not working, it doesn’t necessarily mean that the data is lost or corrupted. In worse cases where the files stored on the disk are lost, the data recovery methods in this article can be helpful. By the way, it’s a good idea to regularly backup files that are important to you. You can even have the backup of your backups.